SYDNEY–(BUSINESS WIRE)–SpeeDx Pty, Ltd. heeft een overeenkomst met Cepheid aangekondigd voor de vervaardiging van hun toonaangevende ResistancePlus®-tests voor gebruik op het GeneXpert-systeem. De eerste test in Cepheid’s FleXible Cartridge-programma, gepland voor lancering begin 2019, is ResistancePlus® MG, dat de seksueel overdraagbare aandoening (STI) Mycoplasma genitalium (Mgen) en markers geassocieerd met azithromycineresistentie kan detecteren. “De beschikbaarheid van ResistancePlus MG in een FleXible-cartridge die op het GeneXpert-systeem werkt, is een boeiende en opwindende uitbreiding voor ons”, aldus Colin Denver, CEO van SpeeDx. SYDNEY–(BUSINESS WIRE)– SpeeDx Pty, Ltd. announced an agreement with Cepheid to manufacture their market-leading ResistancePlus® tests for use on the GeneXpert System. 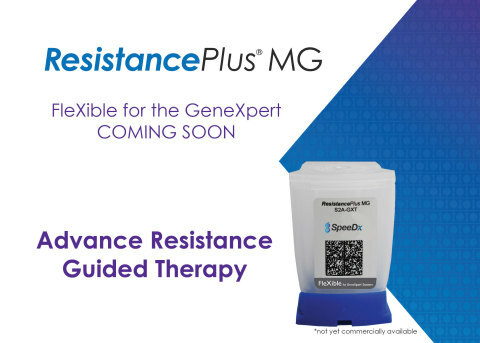 The first test in Cepheid’s FleXible Cartridge programme, planned for launch early 2019, is ResistancePlus® MG, detecting the sexually transmitted infection (STI) Mycoplasma genitalium (Mgen) and markers associated with azithromycin resistance. Based in Sunnyvale, Calif., Cepheid is a leading molecular diagnostics company that is dedicated to improving healthcare by developing, manufacturing, and marketing accurate yet easy-to-use molecular systems and tests. By automating highly complex and time-consuming manual procedures, the company’s solutions deliver a better way for institutions of any size to perform sophisticated genetic testing for organisms and genetic-based diseases. Through its strong molecular biology capabilities, the company is focusing on those applications where accurate, rapid, and actionable test results are needed most, such as managing infectious diseases and cancer. For more information, visit www.cepheid.com. 5. Getman D, Jiang A, O’Donnell M, Cohen S. 2016. Mycoplasma genitalium prevalence, coinfection, and macrolide antibiotic resistance frequency in a multicenter clinical study cohort in the United States. J Clin Microbiol 54:2278-2283.